Unveiled in August at Samsung Galaxy Unpacked 2018, the availability of the new Galaxy Watch in Singapore has been announced by Samsung today. Stay Connected with Longer Battery Life: With the redesigned Galaxy Watch, users will be able to stay connected and do more of what they love, thanks to a long-lasting battery that can last up to 80 hours. Consumers can spend less time worry about charging the device and more time living in the present with the My Day watch face, which helps users plan their day effectively and effortlessly. Live a Balanced Life: Designed with wellness in mind, the Galaxy Watch offers a true holistic health experience with its new stress management tracker, which automatically detects high levels of stress and offers breathing exercises to help keep users centered and focused. Its new advanced sleep tracker monitors all levels of sleep, including REM cycles, to help users adjust sleeping habits and get the rest they need to take on their day. The Galaxy Watch also recognises 39 kinds of indoor and outdoor exercises, helping users to be their best self by keeping track of their workouts. In addition, the Galaxy Watch is equipped with intuitive calorie tracking and personalized alerts. Tough and Durable, Perfect for All Activities: Equipped with certified military-grade protection with scratch-resistant Gorilla Glass DX+ and 5 ATM water resistance, the Galaxy watch is the perfect device for water sports and outdoor activities. A simple switch to Water Lock mode helps to prevent water from inadvertently activating the smartwatch functions. Sports enthusiasts can now freely do what they love, while keeping in style. Payment On-the-go with Samsung Pay: The Galaxy Watch also features Samsung Pay, making payments accessible on users’ wrists, where they are able to pay for all their daily essentials on the go! Consumers can also earn points from their Samsung Pay transactions with Samsung Rewards, where they can redeem their points for additional rewards in the form of gift vouchers from participating merchants or to participate in the in-app games. Beginning 6th October 2018, consumers who purchase the Galaxy Watch will be entitled to receive a complimentary Wireless Charger Pad, with a value worth $78. The promotion is available at local telecommunication operators (M1, Singtel and StarHub), major consumer electronics & IT stores, Samsung Experience Stores, Lazada Singapore, selected online marketplaces and all other authorised retailers. Samsung will also be holding launch promotions for the Galaxy Watch, exclusively available at Galaxy Studio. Consumers who purchase the Galaxy Note9, Galaxy S9 or Galaxy S9+ at Galaxy Studio from 3-28 October 2018 will entitled to receive a $50 discount on their purchase of the Galaxy Watch. Consumers are invited to experience the different zones of Galaxy Studio to learn more about the all-new Galaxy Note9, Galaxy Tab S4 and Galaxy Watch, where they can also experience different fun and exciting activities. Visitors will be able to redeem a complimentary umbrella, and also stand a chance to win a Galaxy Note9 daily! For more information, please visit https://www.samsung.com/sg/wearables/galaxy-watch. The battery capacity is 472 mAh for the Galaxy Watch (46mm) and 270mAh for the Galaxy Watch (42mm). 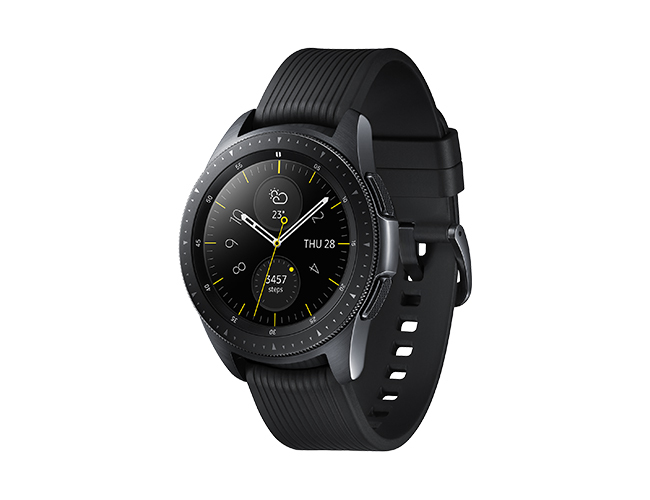 Battery lasts over 80 hours in Bluetooth mode, only for the Galaxy Watch (46mm). Actual battery life varies by network environment, features and apps used, frequency of calls and messages, number of times charged, and many other factors. Intended for general wellness and fitness purposes only. Not intended for use in detection, diagnosis, treatment, monitoring or management of any medical condition or disease. Any health-related information accessed through the device and/or application should not be treated as medical advice. Users should seek any medical advice from a physician. Galaxy Watch has an ISO 22810:2010 certification for wristwatches for 5 ATM rating of 50 meters (165 feet) under defined conditions of pressure, time, velocity and temperature. However, Galaxy Watch should not be used for scuba diving, water skiing, or other activities involving sudden temperature changes, high-velocity water activities or submersion below shallow depth. Rinse in fresh water and dry after use in sea water. Galaxy Watch only supports NFC Samsung Pay. Service availability and features may vary by carrier, country, region or OS, and may change without notice. Please check availability before use. Purchase of Galaxy Note9, Galaxy S9 or Galaxy S9+ and the Galaxy Watch must be made in a single receipt. Limited to one redemption per visitor. While stocks last. Contest terms and conditions apply. Please visit http://www.samsung.com/sg/smartphones/galaxy-note9/galaxystudio/tnc for details. Assassin’s Creed Odyssey launches tomorrow with Ubicollectibles figurines!